Every so often, a game trailer hits me with an aesthetic so pure, so exact, that I sit back and think: Damn. That’s spot on. People are going to go bananas for that. Clearly, Samurai Punk inspires said feelings with The American Dream, a game it describes as, ‘a satirical virtual reality trip through a 1950’s world’s fair where you learn to live your life with guns.’ As a Midwesterner living in turbulent times, I find myself connecting to the absurdity of the project, and these things in mind, I chatted with Director/Artist Nicholas McDonnell. Erik Meyer: I watched a sneak peak of The American Dream, a 1950s aesthetic filled with burger grills, prom dances, and yard work. As you’ve been developing the project, how do you work to keep gameplay feeling fresh, even as you make use of cliches and stereotypes that viewers will undoubtedly be familiar with? What is your philosophy driving the experience, and what kinds of fine tuning do you employ to get the right look/feel? Nicholas McDonnell: That’s a great question. We actually ended up making a bunch of levels that didn’t end up shipping in the game for this reason. Keeping the context fresh is pretty easy, the 50’s tropes are a deep well of comedy so the trick was picking content that stuck with the themes of the game and allowed us to tell our story within their structure. Additionally it’s important to mix up the pace in VR for each level to stop players feeling fatigued over the whole experience. EM: Sections of the game transpire like a theme park ride, with a car moving along a track, beginning with infancy and arriving, eventually, at adulthood. While this movement mechanic lends itself well to changing VR scenery, it also provides immediate orientation within the locations, so which aspects of the game have come as a result of the VR focus, and what mechanics do you see translating across any medium? NM: The VR focus is actually what led to the game in the first place. When the game was just a nugget of the idea “what would it be like to play as an FPS character at home making coffee”. We went from there to a prototype but needed a context to tie all our disparate gameplay together. The theme park was perfect for that sense of a surreal space that allowed for lots of weird gameplay but would keep the player in the experience over the full game without loading screens and move them from level to level. EM: Buddy Washington, the narrator, provides atmosphere, levity, and a great deal of information, so from an audio perspective, what goals did you set out to accomplish with Buddy, and how responsive do you feel he needs to be? NM: Buddy’s primarily there to act as a guide and a source for a lot of the humour in the game. The responsiveness is dependent on the level but generally we’ve found where possible it’s always best to give him a line or two to react with to round out his character. Given the player is always firing guns wildly it’s a fun balance to try and make sure Buddy is always audible over the booming gunshots. 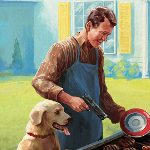 EM: Some of the game’s mechanics, like reloading by pressing a button, which launches a clip in the air, which the player catches with the base of the pistol grip, are fun, all on their own. Especially within the VR space, how important is it that every physical action be enjoyable, and how do you balance a need to have players perform a specific action with a need to have those actions be fun? NM: So these mechanics are something we added early on in response to feedback that the game was funny but not fun. Adding reload mechanics for each gun ended up being a really good way to add an internal game loop into the game that was fun and separate from what the player was doing in each individual level. In terms of balancing them we had most of our reloads designs before the core levels were added so they really just added an element of pacing to the levels that helped drive up and down gameplay tension for specific actions. EM: Samurai Punk has a few projects under its belt (Screencheat, Fruits of a Feather), so how have those experiences informed your process with The American Dream? How have your methods of coordinating as a team while adding content shifted as you’ve gone along? NM: Hugely, we were ex students when we started Samurai Punk and each of those games including another project that isn’t out yet has taught us so much about shipping and releasing games. The team size for The American Dream is a large increase over Screencheat which was just 3 people but a lot of our lessons from the development carried over. One of the biggest things was since Screencheat launched on console was the ability to plan with all of the hurdles that involves in mind like certification and ratings. EM: Twenty years ago, a certain percentage of Americans would’ve probably taken the game to be a wildly enthusiastic pro-USA act of patriotism, but the early 21st century has come with many Americans pulling back from nationalism (even the tongue-in-cheek, over-the-top variety), so has this change in American identity affected the project? What kinds of feedback have you been getting from the gamer audience? NM: So we went into the project expecting a super gungho response from the US and on the whole we’ve had pretty positive feedback. I think the rest of the world has this perception that America can’t take a joke but we’ve seen them generally enjoy the humour. EM: While much of the game falls within somewhat normal laws of reality, a few locations (the prom dance, for instance) have anthropomorphic guns that walk around, have eyes, and interact with the player character. Every fictional universe has its own rules, so within The American Dream, what serves as guiding principles? NM: We generally kept everything within a sense of “this could be a ride at Disneyland” The structure of the game is based of the old Disney World of Tomorrow from the 1950s which had a similar feel. That’s why the people are all made of wooden panels an animate on hydraulics and the guns are meant to be very advanced animatronics. EM: The primary tool (for everything from flipping burgers to watering plants) is guns, which brings to mind the adage: if all you have is a hammer, everything looks like a nail. As you’ve created game puzzles and challenges, what hurdles have come from the weapon modality, and where have things clicked immediately? NM: So the funny thing is actually trying to avoid gameplay that makes the game feel like a point and click adventure game. The easiest way to change this was add varied guns that naturally present different gameplay like the SMG for trimming hedges or the rifle for precise far away targets. This kind of goes back to the first question were we just had to throw away a lot of content as it didn’t feel like it was broad enough and showed a range of activities.